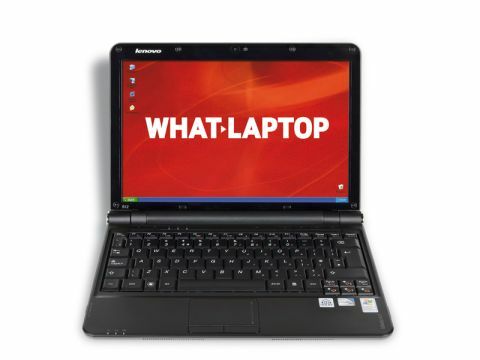 Lenovo is best known for its ThinkPad business laptops, but its IdeaPad range provides entry-level systems for both corporate and consumer use. The IdeaPad S12 is its 12.1-inch offering and strikes a balance between a netbook and a full-sized ultraportable. As one of the larger netbooks available, the 1.6kg chassis lacks the mobility of its rivals. Despite using a fairly slimline battery, it protrudes 14mm from the rear of the chassis, adding to the bulk of the device. Battery life is excellent, however, running for 334 minutes. Build quality is average, but fails to match the standard set by the Samsung N310. The matt plastics are resilient enough, but the glossy plastics on the lid are prone to scratches. The patterned finish is not the most stylish we've seen and won't suit all tastes. The extra size of the chassis allows space for a full-sized keyboard, which continues Lenovo's reputation for high-quality usability. All the keys move smoothly and firmly and this is one of the most usable netbooks we've seen, making it ideal for frequent business use. The 12.1-inch screen has a 1280 x 800-pixel resolution, letting you work with several windows open at once, and image quality is excellent. Brightness, colour and contrast are strong – although the Fujitsu is brighter – so photos and videos look great. A key selling point of Lenovo machines is the comprehensive, pre-installed proprietary software. Tools for data backup and system restoration are included, among others, making it very easy for even beginners to access advanced system maintenance tools. An integrated camera is fitted above the screen. Facial recognition software lets you log into Windows by looking into the camera. Dolby Pro Logic offers pseudo surround sound via headphones, but we found the effect less than impressive. Storage is more than capable for basic use. The 160GB hard drive will hold plenty of music and photos – and the 4-in-1 card reader allows access to flash storage cards. Despite the large chassis, there is no integrated optical drive. 802.11g Wi-Fi provides fast access to wireless networks, although it's slightly slower than the 802.11n-equipped Asus Eee PC Seashell 1008HA. Bluetooth lets you wirelessly share files between devices, while three USB ports let you connect wire-based peripherals. Although the size of the IdeaPad S12 makes its netbook status questionable, it is nevertheless a very usable and wellmade machine and provides an affordable alternative to business ultraportables, without scrimping on features.